There are two new models in the Mechanisms pack bringing the total to twenty five! From belt drives to gears trains, all sorts of amazing working projects for you to download and make. Visit the webpage for more details and to download your copy. 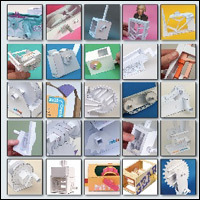 I believe that Rob's mechanical models are the best value in paper modeling on the web! These models are Fun, Educational, as well as Entertaining. When you build one of his models you build a memory. When you build a Rob Ives model with Friends, Family, or even at school you build a memory for a life time.